DALLAS—SOLIDWORKS WORLD—Stratasys is working to remove complexity from design-to-3D print processes and thereby empower designers and engineers to embrace new 3D printed possibilities. GrabCAD Print’s Advanced FDM feature is aimed at ensuring design intent via intuitive model interaction to rapidly deliver strong, light, and purpose-built parts. By avoiding laborious CAD-to-STL conversion, users can work in high fidelity and rapidly advance the design-to-3D print process, Stratasys said in a press release. Advanced FDM is designed to speed part production, while maintaining creation of purpose-built parts that minimize weight without compromising strength. With rich CAD-native build controls, the solution doesn’t require manual generation of complex toolpaths, cutting overall programming times for 3D printing. Intuitive features achieve desired part characteristics through automatic control of FDM build attributes. 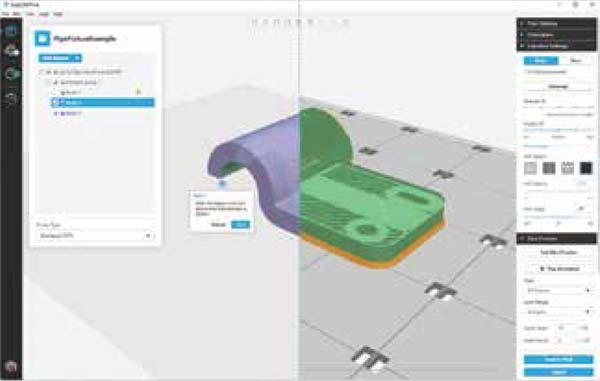 Engineers easily select areas on native design geometry and specify design attributes, letting Advanced FDM automatically calculate 3D print toolpaths, the company said. Assigning attributes directly to CAD models, users pinpoint areas of strength and rigidity, control infills, ensure sufficient material around holes with inserts, and avoid seams. Because toolpaths are automatically generated from model assignments, the user can expect to spend significantly less time on part setup, without losing strong, high-quality, purpose-built FDM parts. Stratasys (www.stratasys.com) is a provider of additive manufacturing, or 3D printing, technology and is the manufacturer of FDM® and PolyJet™ 3D Printers. The company’s technologies are used to create prototypes, manufacturing tools, and production parts for industries such as aerospace, automotive, healthcare, consumer products, and education. GrabCAD and Stratasys are registered trademarks, and GrabCAD Print, F370, Fortus 380mc, Fortus 450mc, Fortus 400mc, Fortus 900mc, and F900 are trademarks of Stratasys Ltd. and/or its subsidiaries or affiliates.